How to convert M2TS to MKV, AVI, MPEG, MP3, MOV, etc? How to convert DVD to YouTube Video? How to burn music to DVD step by step? How to create video files played in Mobile Phone? How to recover data from damaged or formatted disks? How to convert XviD to DVD, WMV to DVD? How to convert Flash SWF to FLA on Mac? How to Batch Split PDF with Pdf Split Merge Pages? M2TS is a container file format for multiplexing audio, video and other streams. It is based on the MPEG-2 transport stream container and is also known as BDAV MPEG-2 transport stream. This format is commonly used for high definition video on Blu-ray Disc and AVCHD. The M2TS container format is a standard used on Blu-ray Video discs. Blu-ray Disc Video titles authored with menu support are in the BDMV (Blu-ray Disc Movie) format and contain audio, video, and other streams in BDAV container (.m2ts), which is based on the MPEG-2 transport stream format. Currently, M2TS files can be played using the Picture Motion Browser, which is an application video player provided with Sony AVCHD camcorders. M2TS files can also be played with Mplayer, Windows Media Player and other media players if there is a codec for DVD playing installed. But the file type .M2TS is not always automatically associated with the player, so it may be necessary to open it from the player. That's to say, it's not convenient to play and enjoy your M2TS video. This page will guide you how to convert M2TS to to all sorts of video formats like MKV, AVI, MP3, SWF, DivX, XviD, MOV, etc. Step1. Please download M2TS Converter. Step3. Click to edit video files. Step4. Select output format from the "Profile" list. After you added M2TS files, you can select an output format for each video file and specify a directory on your computer to save the output files. 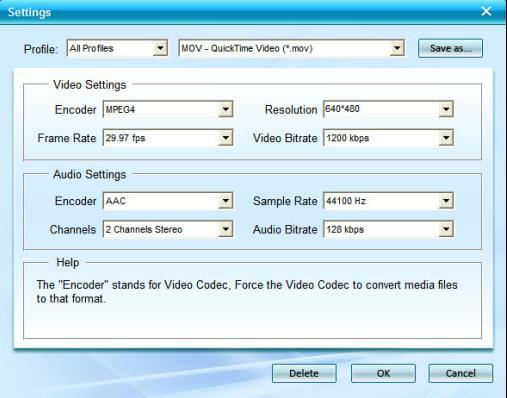 M2TS Converter supports comprehensive video formats including AVI, MPEG, WMV, MOV, XviD, 3GP, FLV, OGG, AAC, MP3, etc. Moreover, M2TS Converter supports converting M2TS to iPod, iPhone, Apple TV, PSP, PS3, Xbox, and other popular devices. If you don't know what formats your device supports, you can just select the format according to the device name. for exapmle, you can select 'MOV-QuickTime(*.mov)' when you want to rip DVD to QuickTime on Mac. The default setting works well. Of course, if you don't want to use the default video and audio encoding settings, just click the "Settings" button to customize these settings. Step 5. Click to convert. How to convert MIDI to WAV with MIDI to MP3 Converter? How to convert AVI, WMV, MPG, ASF, MPEG to Flash step by step? How to convert XviD to DVD, WMV to DVD step by step? How to convert AVI to iPhone MPEG4 for mac? How to convert avi to mpeg, divx to mpeg? How to convert AAC to MP3 with AAC to MP3 Converter?